We had a few extra days to spend in Bolivia and decided to take a two-day trip with Grupo Rossario to Lake Titicaca, its primary Bolivian city and religious pilgrimage site of Copacabana (the original, after with the Rio beach was named) and the Pre-Columbian Incan archeological sites on Island of the Sun. But before we could enjoy these sites, we had a three-hour drive to the lake. After escaping the incredible congestion, the bad roads of the metropolitan La Paz area (not to speak of the effigy hangings of criminals that are a warning of the neighborhood justice that compensates for the lack of police), we sped (in relative terms) along a reasonably smooth (other than for the periodic construction projects), traffic-free road through miles of tranquil farmland and towns, with scattered views of 20,000+-foot, snow-capped Andes peaks to the north. 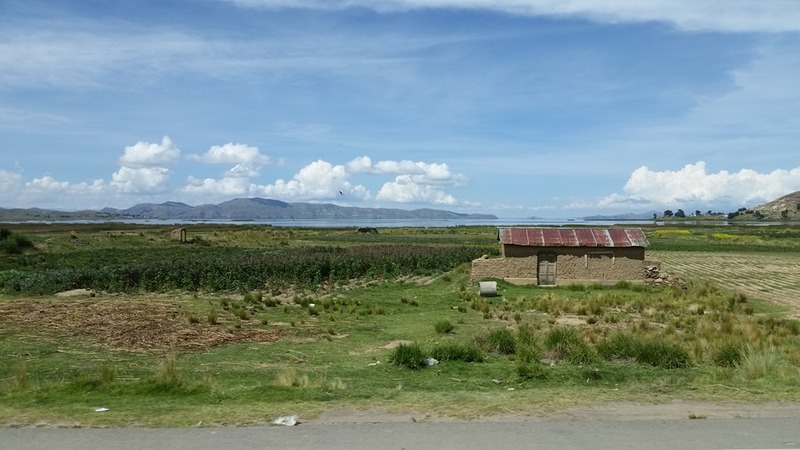 Further on, we caught of first views of the South Lake, climbing to a high plateau with lovely views of the lake, surrounding hills and occasional islands. 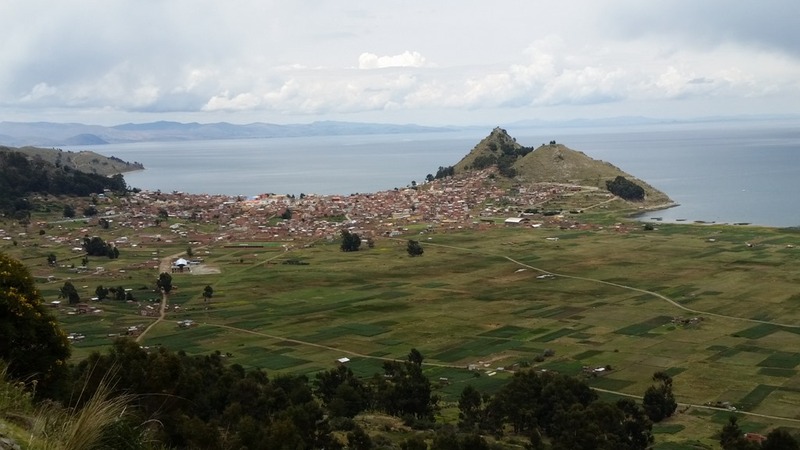 Titicaca, which creates a border between Bolivia and Peru, is the highest lake in the world, at 3,810 meters or 12,500 feet), about 650 feet higher than La Paz. 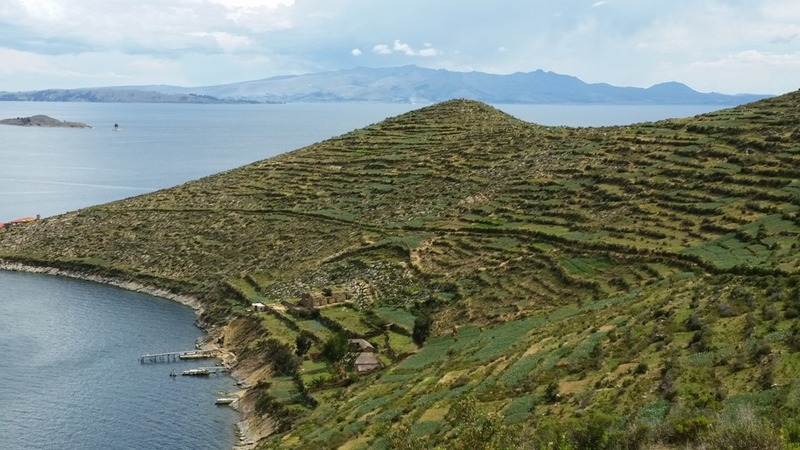 It is also large (5,000 square miles), deep (up to 300 meters) and salty (0.98 percent salinity)—too salty for either drinking or irrigation. It does, however, support a few species of fish: Two primary food fish that were introduced from other countries (Salmon Trout from the U.S. and Kingfish from Argentina) and three small, native species. The lake also contains something much more interesting. 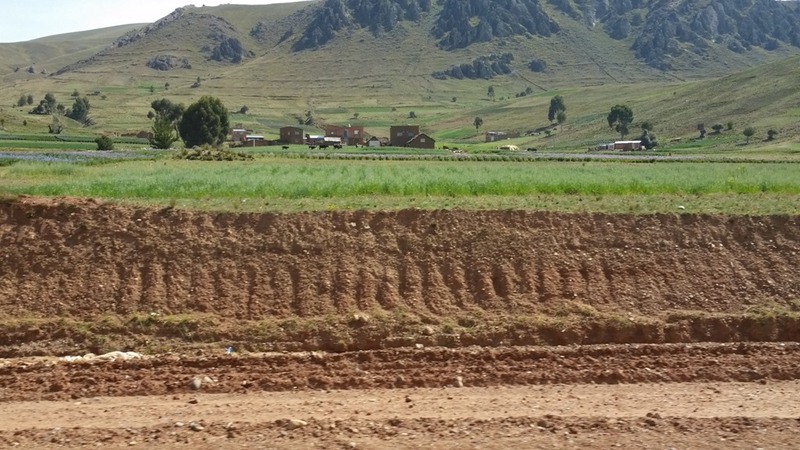 Although legend had it that the area around the lake had contained a very old city, it was not until the 1970’s that Jacque Cousteau conducted a systematic scuba-based study that confirmed the existence of underwater ruins that appear to date from about 10,000 years ago, much earlier than the previously assumed Tiwanaku era. This opened the area to much more archeological research, which is now being conducted. 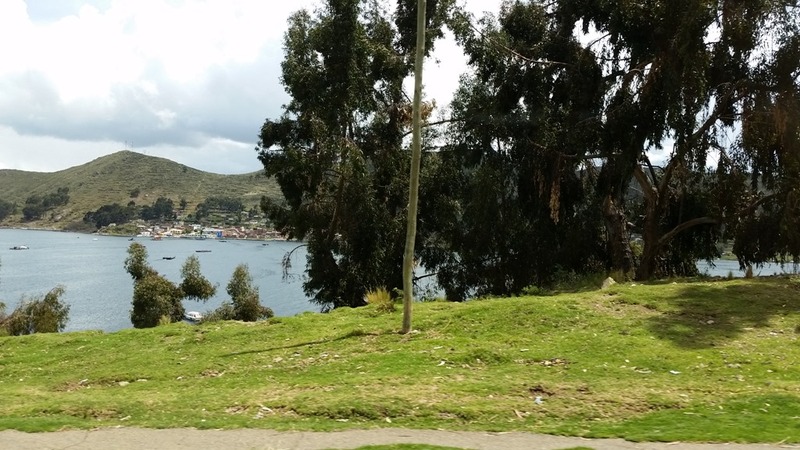 We then reached the narrow Tiquina Strait, which required our van to board a small ferry that used a combination of poles and motor to take us from the small town of San Paul, on one side of the strait to the larger, appropriately-named San Paul on the other. 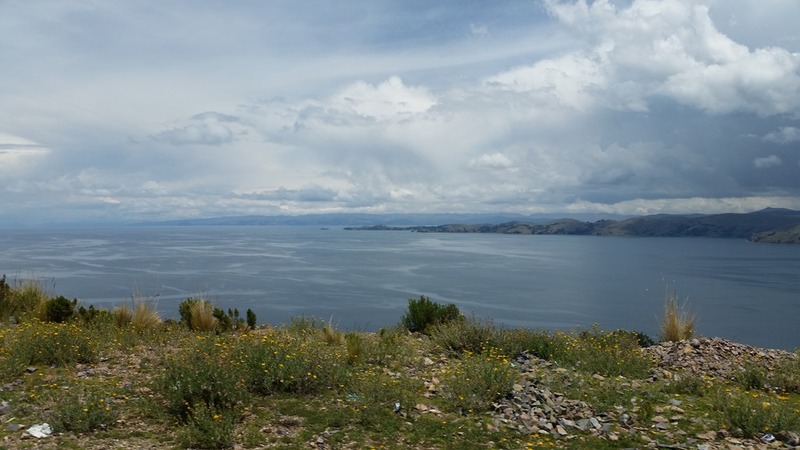 We then drove a beautiful hilltop stretch atop the isthmus that divides the southern half of the lake from the north. 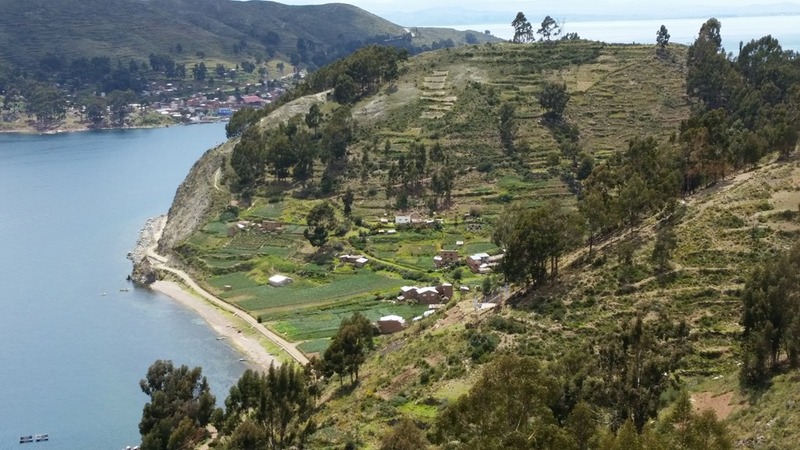 It presented a panorama of incredible views over eucalyptus-lined cliffs, past ancient stone agriculture terraces (originally built during the Chiripa, Tiwanaku and Inca eras that are still used today), to picturesque inlets and expansive views over the lake. 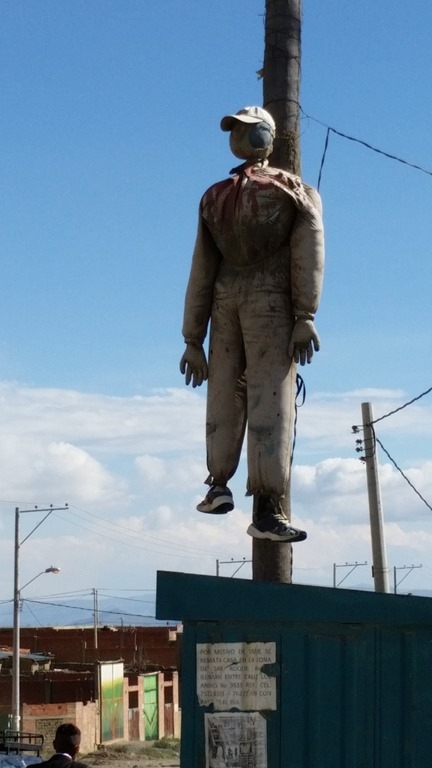 The entry to Copacabana was, if possible even more dramatic. Views down over a steep broken sandstone cliff, overlooking farmlands to the 18,000-person town which lies at the base of the dramatic Calvary Hill. 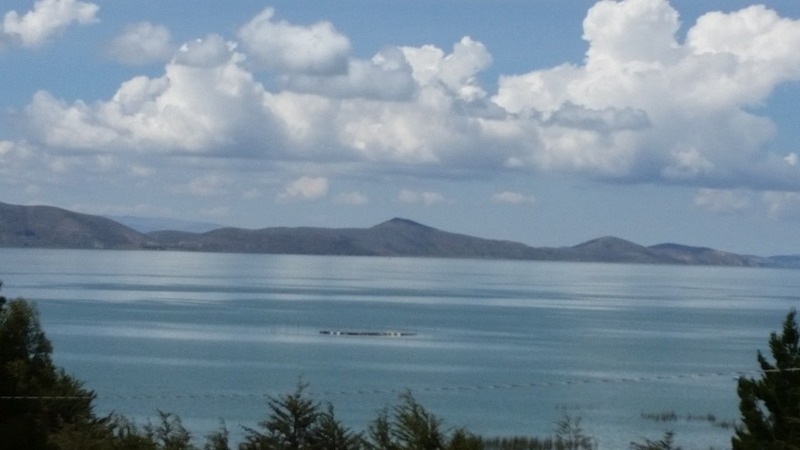 We could see across the lake to our afternoon destination of Sun Island and all the way across the lake to Peru. 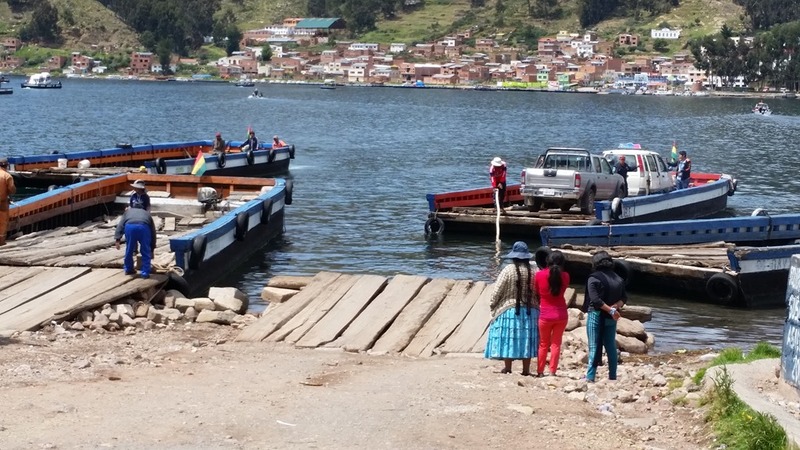 After checking into our hotel (Hotel Rosario Lago Titicaca) and having a lunch, we boarded a launch to the southern shore of the Sun Island. 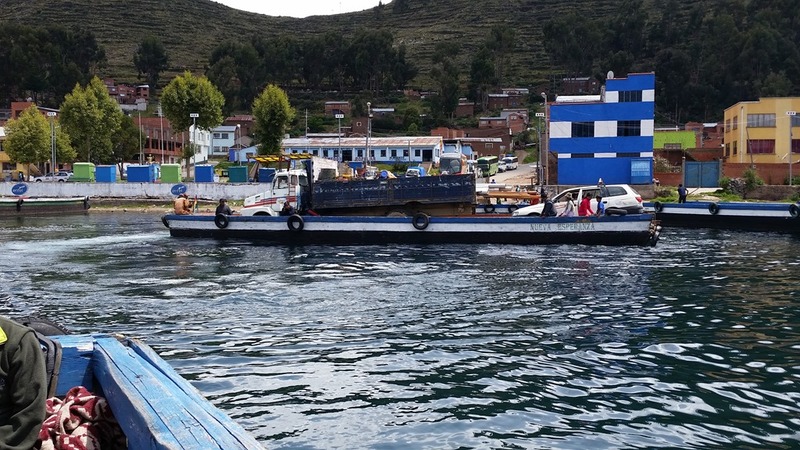 The hour-long boat ride was itself pretty passing by coves and terraced gardens, alongside sheer eroded cliffs and between islands, while gazing at Sun Island and the snow-capped Andes in the distance. The island was better yet. 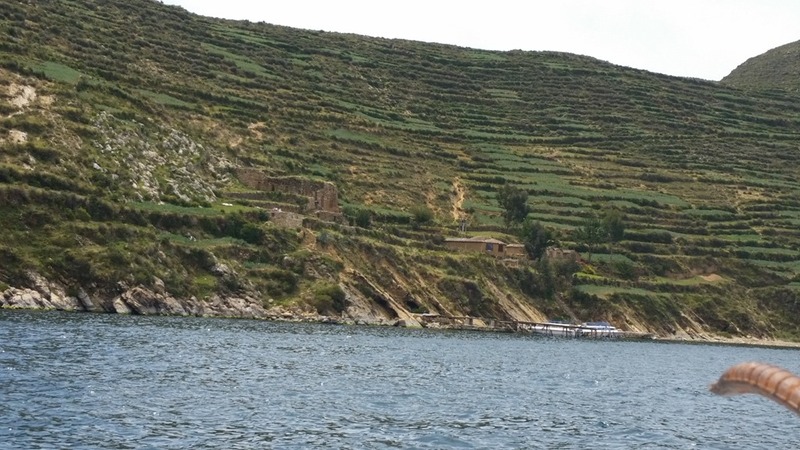 This rocky, hilly island, which subsists on agriculture (primarily on hillside terraces that are fed by an underground spring), fishing and tourism is, to say the least, rustic. It has no paved roads or cars and only two reasonably-sized towns. 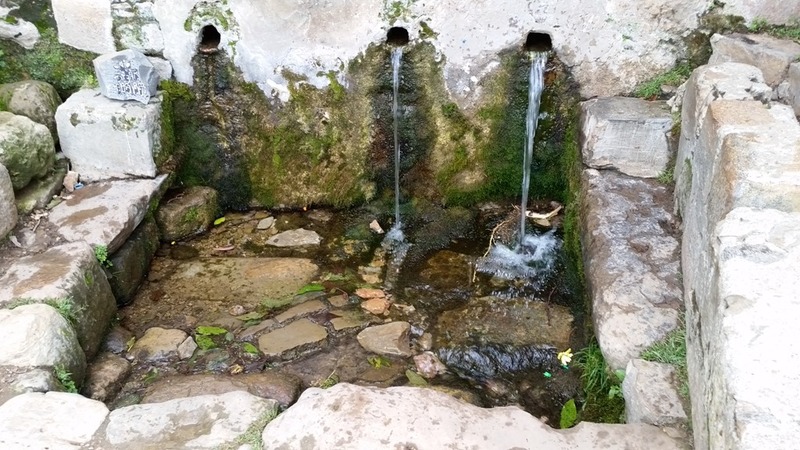 But what it lacks in amenities, it makes up for in history, legend and archeological significance. 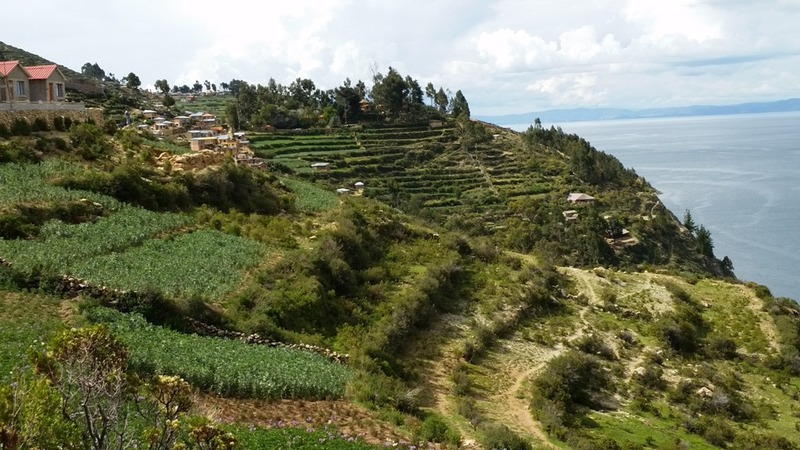 It was, according to Inca legend, the god who created the universe, created the sun on the island. 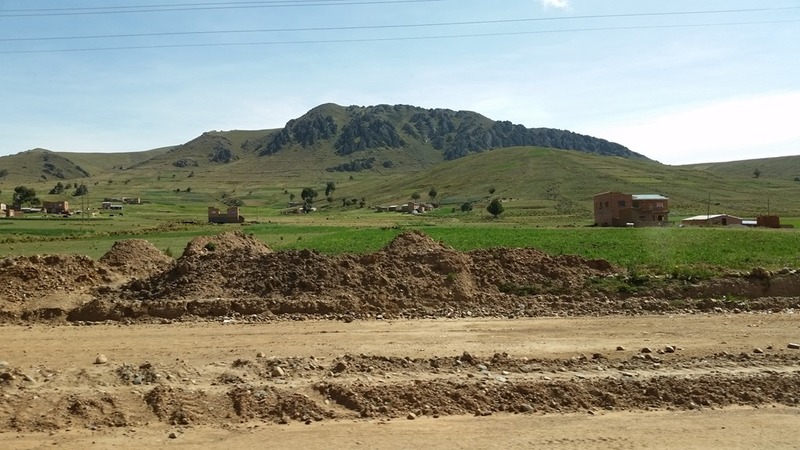 Occupied from at least 2200 BCE by the Tiwanaku and the Inca, it contains roughly 80 ruins dating from the 15th century, along with 3,500-year old pottery and other artifacts from the 15th Century BC. 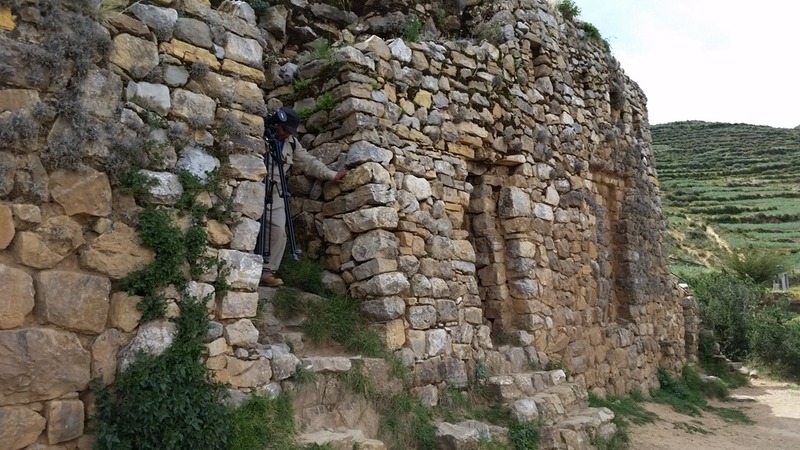 Our first stop was Pilkocaina, thought to have been built in the 7th-century BC as a Chiripa temple and then, in the 16th-century, converted into an Incan fort. 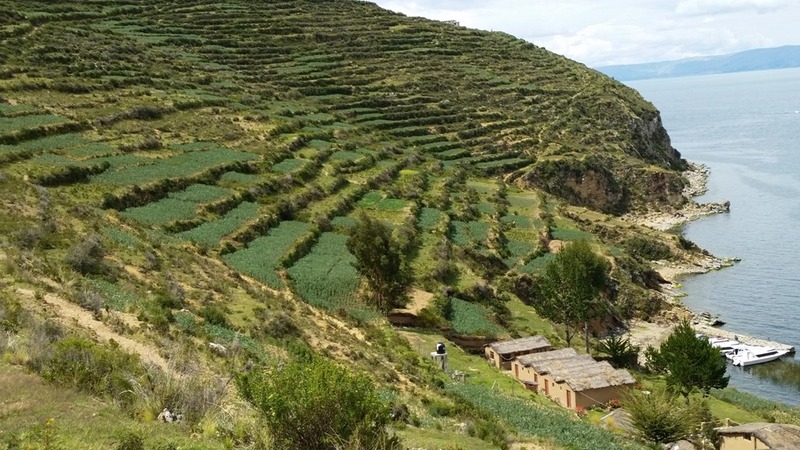 From there, we continued hiking steadily upward along a trail through the lovely terraced fields growing crops including fava beans, potato, quinoa and lupine. 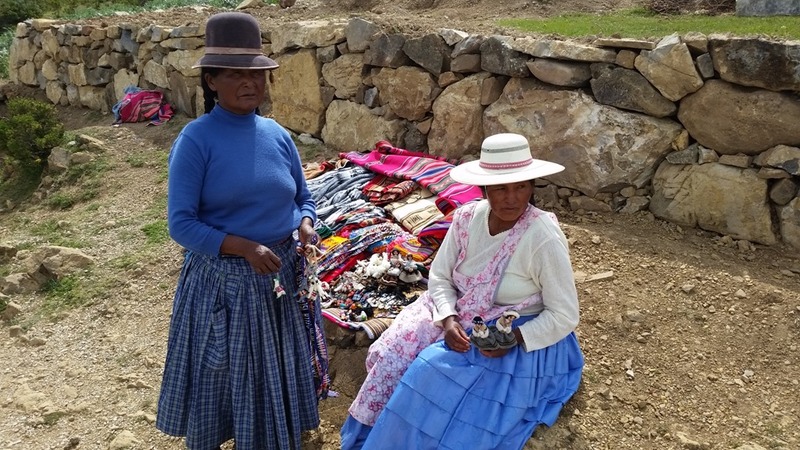 When we reached a pass, we were greed by a couple village woman selling their crafts and a to-die-for view back over the terraces, across the channel to multiple islands and, of course, the Andes. 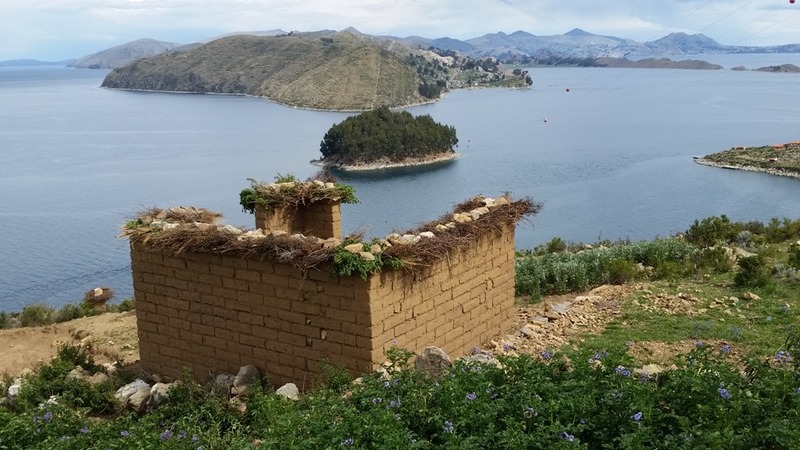 We were also able to see Moon Island, which once housed a school for well-bred Inca girls and from which the Inca King each year, chose one to be his wife and another to be sacrificed. 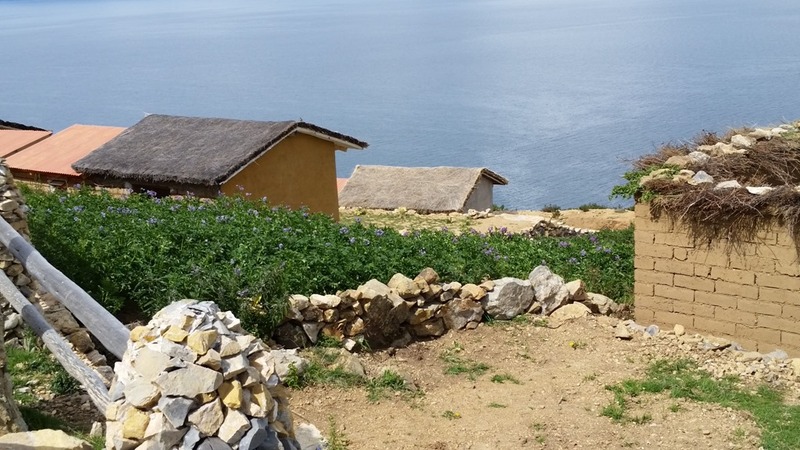 From, there is was all downhill to the Yumani, one of the island’s two primary towns, and the town fountain that was thought by the Incas to be sacred, and later by the Spaniards, as yet another Fountain of Youth (Youthful hope springs eternal.) We then boarded our boat for our return trip to Copacabana where we explored the town on our own and had dinner before retiring for the evening.